It was a good night for gallery hopping Friday night in Pilsen. For those we ran into, so nice to see you! 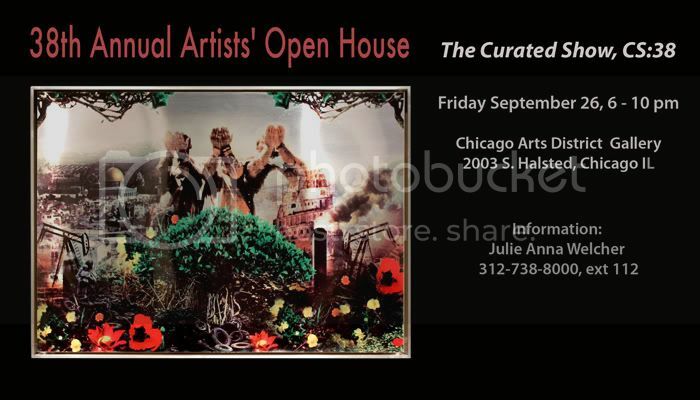 We were impressed with the installation work of Barbara Hashimoto at the "CS:38" show at 2003 S. Halsted. Not only did she shred junk mail for several weeks to make these tiny mountains of confetti, she photographed people clowning in it. Also she was very gracious in person. Kind of odd even for us were the actors dressed in all gray monologuing barefoot throughout the gallery. ???? After a glass of wine I finally worked up the nerve to jump in too. You have to. Earlier that night at Michelle Litvin gallery we enjoyed the truly intelligent, minimal work of Mike Famous and Ben Dallas. They create pieces not together but pieces that play off each other and are hung to show the balance between the 2 artists. I like the amount of attention given to such small pieces and the use of space in exhibition. Mike Famous is the smartly dressed one in the middle. You can't tell but he was wearing the freshest glasses I've seen on a man in awhile. Sort of a half-cream half-woodgrain style. We picked Mike's brain forever only to run into SNL Alum Nora Dunn on the way out. Funny. It's Fall friends and fashion and art are in the air. This is where we will be this week. And yourself? 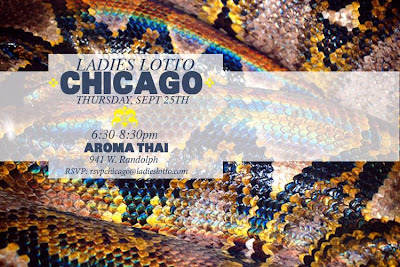 Well, maybe you can't come to the members only Ladies Lotto event but you definitely should try to check out dope artist Miguel Guzman in Pilsen Friday. Now that we have recuperated from our Houston visit, here's a little of what went down. Houston's own Sucker Punch showed some hometown love. Tipping Point too. A new talent, Antoinette performed her single. Someone tell me the name cause it was dope. Then there were lots of fashion shows. Too many to post. We see you K. Smith. Then Christian Rich made a Nicole sandwich. Hopefully they will come home to the Chi soon. Coordinator of the expo, Crystal of Finest Living rocking Cake from Shrink. After 6 hours of selling it was margarita time. 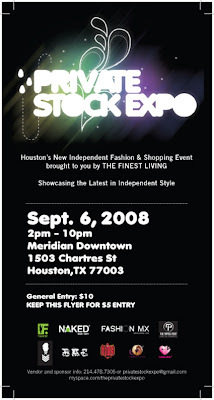 We just touched down in Houston for Private Stock Expo, THE shopping event to attend Saturday. Deets(details)below on the flyer. Can't wait to meet everyone involved! I was just warming up to red states until I ran into everyone's favorite airport bar, Riggers! Yeah yeah I'm sure you're gonna tell me all about the connection to oil drilling blahblahblah. Rigger please. Nice skyline, view from our room. Okay I am in love with these trolleys from the future. Very cute for public trans right? Take a look a this old Eddie stand-up. Funny and historically relevant.